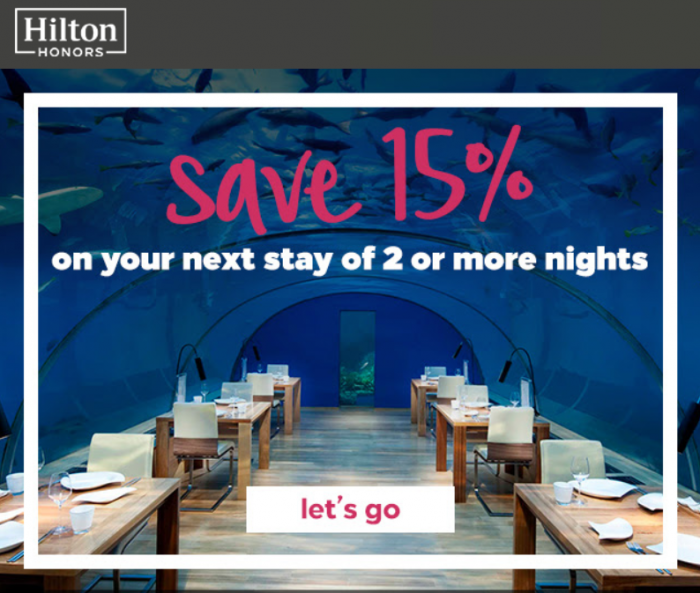 Hilton Honors has launch “targeted” offer for 15% off two night stays in the Americas through January 31, 2019. The offer, although supposedly targeted, seems to be open for all as it doesn’t require any codes to book. There is the MVP (read more here) plan that offers 20% off rates in the Americas and the Gold one (read more here) for 15% off both when available and with some eligibility restrictions. Perhaps some readers can save some using this 15% off plan over regular Hilton sales or AAA rates. Please note this offer is only valid for recipients of the email invitation, is not transferable, and is one-time use only. Offer valid at participating hotels and resorts in the Hilton Honors™ portfolio in the Americas. Subject to availability. Valid for stays booked and completed between now and January 31, 2019. Check out date must be on or before January 31, 2019. Must book Plan Code “ZZDP15” or “ZP1”, online only. Minimum two night length of stay required. Offer valid for all days of the week. Participating hotels are offering a 15% discount off the hotel’s Best Available Rate. Rates are valid for single/double occupancy and are exclusive of all taxes, gratuities, incidental charges or resort fees (if applicable). Each hotel’s change and cancellation policy varies. Please contact the individual hotel to confirm their policy. Offer components are non-transferable or redeemable for cash, and cannot be applied toward future stays. This offer may not be combined with other select promotions, offers or discounts and is not valid for groups.